This week’s tip is about MobaXterm, a very handy terminal and SSH tool for Windows that’s incredibly easy to use and can perform more advanced operations than PuTTY. While PuTTY is a great starter tool for getting access to your remote machine’s command line, MobaXterm offers support for many protocols, such as SSH, VNC, FTP, SFTP and has a tabbed interface for easy access to all of your sessions. So let’s get started! We’ll first need to install MobaXterm, go to the MobaXterm official website and click Download Now under the Free Home Edition. There are two versions available, Portable and Installer, which are self-explanatory. Click to the button that best suits your needs and your download will start shortly. Once the download is complete, double click the installation file and install to your desired directory. When it’s installed, we are ready to get started, shall we? Let’s start off by using SSH to connect to your Omega2! Click on the Session button in the top left corner and select the SSH option. In the Remote host textbox, type the name of your Omega, it looks something like: omega-XXXX.local, where XXXX are the last four digits of your Omega’s MAC address. If you wish, you can specify the username by typing root and checking the box Specify username. Click OK and the SSH connection to your Omega will start. You will be prompted to enter your password and will have an option to save it for future use. If you choose to save it, you’ll save yourself some typing the next time you connect to your device. Every session that is started will be saved for future use, making it really quick to connect your various Omegas. You can have as many simultaneous sessions as you want, all easily accessible in their own tabs. MobaXterm also allows you to connect to your Omega via Serial! 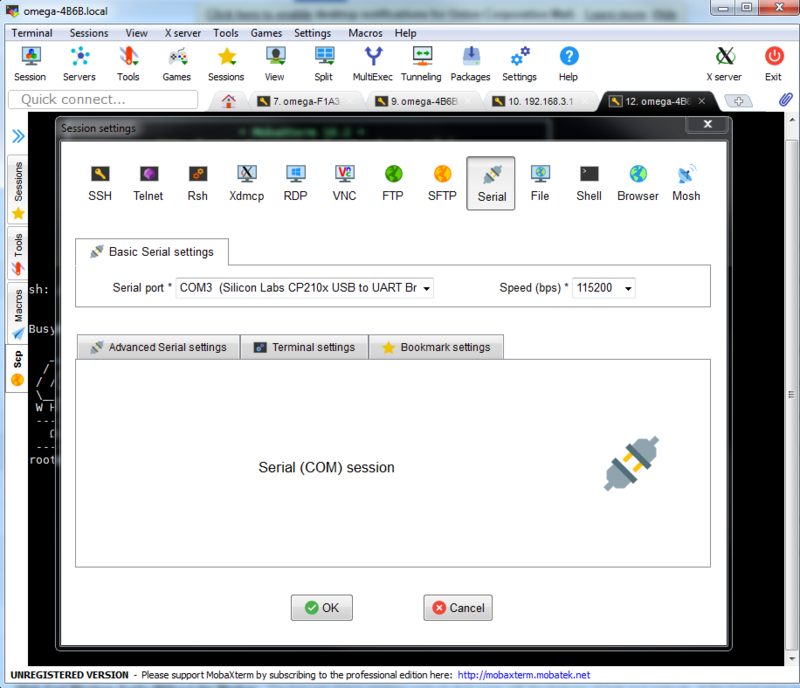 To set it up, click on Session button again and choose Serial. Under the Serial port choose USB to UART and Speed (bps) to 115200. Click OK and you’ll see the familiar serial connection to your Omega! 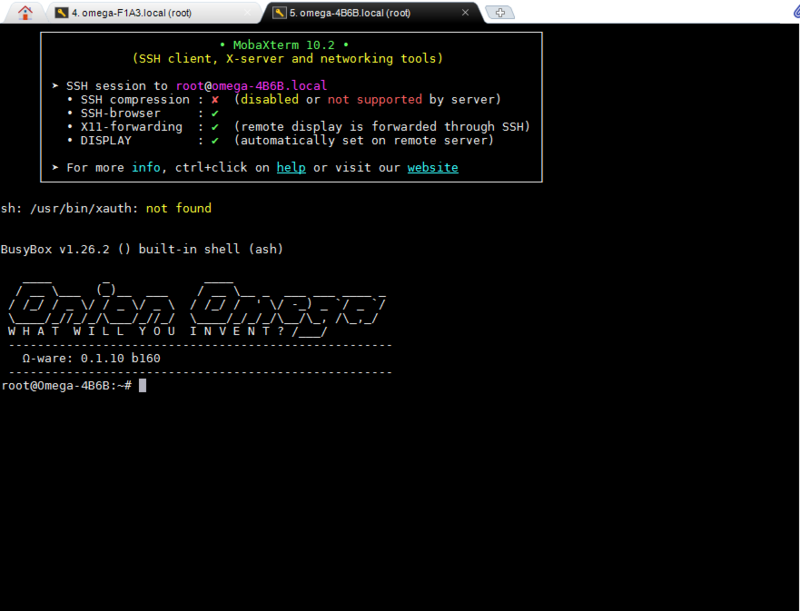 It also offers a colorized terminal, making it easy to discern what’s a file, directory, or a soft-link. Having MobaXterm on your computer is very handy, especially if you’re working with several remote devices, like a whole bunch of Omegas. The friendly user interface will make getting your project up and running a breeze. P.S. Early Bird pricing for the Oboo Clock on KickStarter ends Friday!